The new trophy recognizing the race's record-setting monohulls was unveiled the evening of Thursday, Feb. 25, at Disney Studios in Burbank. From a chicken coop in Santa Cruz to Greenwich, England to the ancient Italian village where Michelangelo and Leonardo de Vinci worked and finally to an unlikely find in downtown Los Angeles - that's the course creative genius followed to produce sport's newest major trophy. 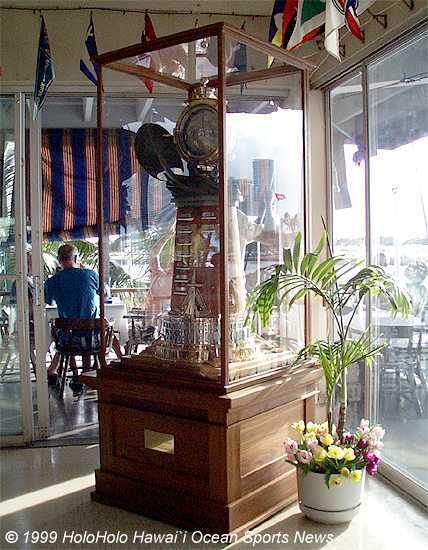 It's the Transpacific Yacht Race Course Record Trophy. It was suggested by Bill Lee, commissioned by Roy E. Disney and created by Andrea Favilli of Pasadena. 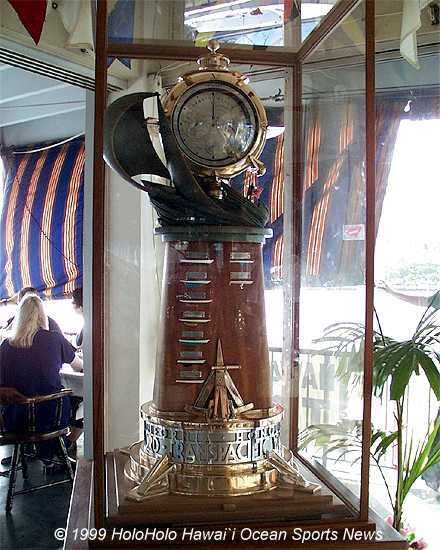 The 55-inch-tall treasure recognizes the eight boats that have held the elapsed time record for monohulls from Harold Sinclair's Lurline in the inaugural event in 1906 to Disney's Pyewacket in '97. Other record-setters were Mariner in '23, Morning Star in '49 and '55, Ticonderoga in '65, Blackfin in '69 and Windward Passage in '71. But it was Lee who started the zeal for real. With the help of a few friends he produced Merlin, the forerunner of the big ultralight "sleds," from a chicken coop on the side of a hill in Santa Cruz and in 1977 sailed it to a record that stood for 20 years. Lee said of the trophy, "It was somewhat my idea that I passed on to Transpac a couple of years ago, and Roy picked up on it." Disney knew Favilli, 36, through his work at the Walt Disney Co. "I'm not a sailor, but I love sailing," Favilli said. "In all my research on the race, the guy I most admire is Bill Lee. So much of what I see the Transpac being is a lot of very wealthy people with some professional crews. I used Bill Lee as the quintessential role model: someone who really worked to win the race. And he revolutionized the race. I always had him in the back of my mind and thought, I want Bill Lee to be proud of this." He is. When the trophy was unveiled in February, "He came up to me and gave me a big hug and said how much he loved it," Favilli said. The top of the trophy is an artistic replica of the H1 clockwork displayed at the Greenwich Observatory. 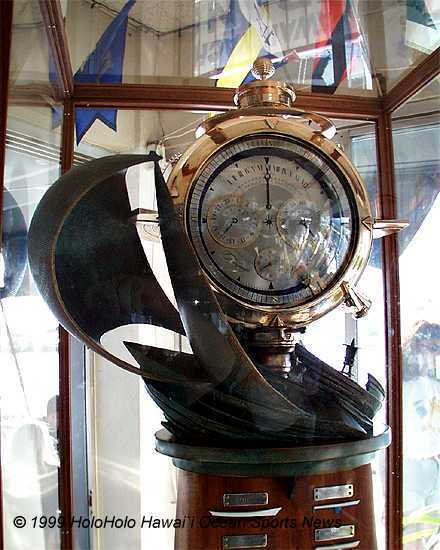 Built around 1730 by Englishman John Harrison, it made ocean navigation reliable for the first time. "It was what solved the riddle of longitude," Favilli said. "I thought if this trophy could have an element like that it would be great, especially since what we're creating is a trophy that concentrates on time by marking a record." Favilli, whose chief assistant is his wife Camille, incorporated an analog clock showing the current record - Pyewacket's 7:15:24:40 - with dials to adjust the days, hours, minutes and seconds when that mark falls. 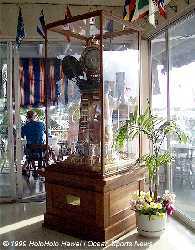 There is also a "time capsule" cabinet, a suggestion of sailing film producer Leslie DeMeuse, whose late father Ken sailed Blackfin to a record in 1969. Born in Italy, Favilli returned to his roots to fashion the bronze portion of the trophy. "I sculpt mostly in bronze," he said. "The craftsmanship in bronze where I cast goes back centuries. It's a little town in the heart of Tuscany called Pietrasanta. Artists like Michelangelo [and] Leonardo de Vinci worked out of Pietrasanta. All the biggies today are there." But Favilli also wanted some strong Hawaiian character in the piece. He hit upon it while in Honolulu on business. "One evening I went walking along Kalakaua Avenue and found the International Market Place [where] this guy was carving tikis. I asked him if there was a tiki god of the ocean. He said, 'Yeah, his name is Ulu.' "
Favilli wanted to carve Ulu's likeness into the trophy in native koa wood, which is hard to find these days. But he said, "I found a little old guy in downtown Los Angeles that squirrels away planks of wood that [look like they] were ripped right off a tree trunk. I bought a 12-foot by 3-foot plank [of koa] from this guy. "I thought it was important to go to koa wood because from the beginning we tried to link the beginnings of the race with King David Kalakaua's desire to see some sort of event that would create a better friendship between the mainland and the islanders. We always thought this is something that will go down through the legacy of sailing," so everything had to be of the utmost quality."